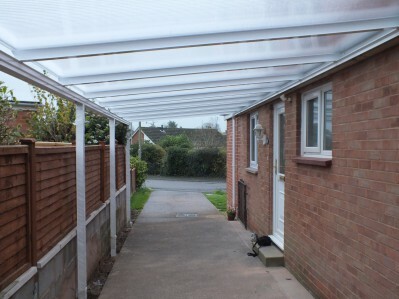 A LuMac allyway / walkway cover offers protection all year round from rain, snow, frost & the sun. We stock white and brown frames & can offer custom sizes & colors on request. 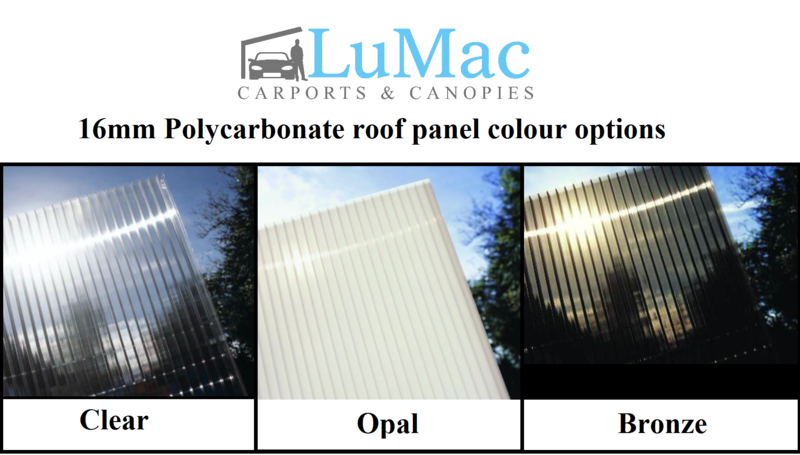 Roof panels are made from 16mm multi-wall polycarbonate and are available in Clear, Opal or Bronze. Include UV protection. All our canopies come with a 10 year guarantee. Please see our latest promotional prices below. Ordering your carport & arranging delivery is just 4 easy steps! (Please click buttons 1 – 4 below for details of each stage). Measure the area you would like covered. You measure the distance away from the wall (we call this Projection). Then You measure along the wall (we call this Width). You do not need to worry about taking the slope of the roof into account, we do this for you so you can just measure the area on the ground you would like covering. For useful documents to help with working out hights please look at the fitting menu at the top of our website. Select the size canopy you would like from the area below. If your size is between the listed sizes then you just pick the next size up and we cut it to your specific dimensions free of charge for you. For example if you would like a 2.7m projection x 2.7m width you can select the “3.0 x 2.8″ then we modify this especially for you to the dimensions you give us. You will be asked for exact dimensions at section 3 next. Click the “Buy Now” button, you can pay securely by either Debit/Credit card or by PayPal. If you need a special size this is where you would enter your dimensions – in the “instructions to seller”. Even after you have purchased you can still change your order or even cancel if you change your mind. Once your order arrives with us we call you to confirm it is exactly what you want then agree a delivery date that best suits you. Delivery can almost always be achieved within 2 weeks, and in most cases much sooner. Once your order arrives with us we call you to confirm it is exactly what you want then agree a delivery date that best suits you. If you wish to change your delivery date later that is still ok up to 2 days before you are expecting your delivery. Please Contact Us for our latest Brown prices.